A zoo keeper wants to place 6 tigers in 4 cages, each can fit a maximum of two tigers. In how many ways can he place the tigers if no cage to be left empty? Are these four cages distinct or identical? Are the tigers distinct or identical? Last edited by fan96; 6 May 2018 at 1:35 PM. If no cage is to be empty and each cage can fit a maximum of two tigers, then there must be either one or two tigers in each cage. Also, there must be exactly 6 tigers. The only way to make 6 from adding 1 or 2, four times, is in any order (that sentence is a bit botched but hopefully you get what I mean). So assuming the cages are identical and they're not arranged in a circle, the problem can be reduced to "How many ways can you arrange two 2's and two 1's?" Another way to solve the problem is to consider each case by making something similar to a tree diagram. If the tigers are distinct, multiply the answer by . If the cages are distinct, multiply the answer by . 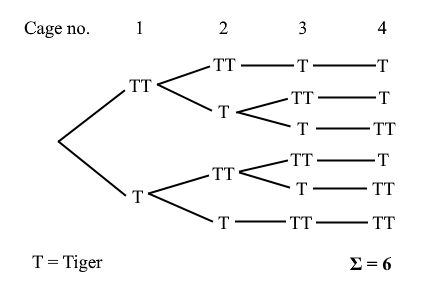 Your answer should be correct if the tigers are distinct but the cages are not ( ). Last edited by fan96; 6 May 2018 at 1:43 PM. Have you tried the Stars and Bars method? Where the stars are the objects and the bars represent the dividers between boxes. So in the above case you would be placing 6 objects in 3 boxes. since there are 6 stars and 2 bars. It's pretty useful to know but for this question, since the numbers are small and there are quite a few restrictions (no more than 2 tigers in a cage, no cage empty), I don't think it's as useful here. You'd have to subtract the cases where two dividers are together (representing an empty box) and when there are more than two stars next to each other (i.e. more than two lions in a cage). Last edited by fan96; 6 May 2018 at 4:26 PM. Can you give me a good question and can you please work it out with this method? Last edited by InteGrand; 24 Jun 2018 at 2:50 PM. there must be at least one ring on each finger? there are no restrictions and the rings are all different? Is that a past HSC question? fan when there are no restrictions its 220 right? for ii) it is 220 - cases with a finger or till 4 having no rings. Where the eight "_" characters represent possible spaces for a divider, of which there must be three. Thus the answer is simply . I doubt it. If it is, it would be from a long time ago and would be coincidence (I didn't pick that question out of a past HSC paper). I included it since it's a nice application of Stars and Bars. Thanks for the link to the stripes and bars, the wiki article is way too complicated for me, but I think I get the gist of it. a) there are no restrictions? b) there must be at least one ring on each finger? c) there are no restrictions and the rings are all different? b) I didn't get this initially, but the explanation above made al ot of sense, so I get it now. c) 9 stripes (each different) + 3 bars, so: 12! / 3! = 79833600 <-- dividing out the identical elements - the stripes are not identical, so not divided. If going via Stars and Bars how does one accomplish it? *** | ** | **** | *. That above pattern would represent buying 3 of the first lollipop type, and 2, 4, 1 of the second, third and fourth lollipop types respectively. The total number of ways to buy the lollipops is the total number of ways to arrange the objects in the above picture, which is (13!)/((3!) (10!)). In other words, your answer is correct. btw why do u divide by 3! isnt that representing distinct lollipops? and How did u solve fan96's qtn b Roy G Biv? and b for fan96 question - just place 1 ring on each finger before you even start the question - since the rings are all identical, it doesn't matter which ones you place. remaining 5 rings onto 4 fingers: use stars and stripes method, as explained above. All times are GMT +11. The time now is 7:40 PM.